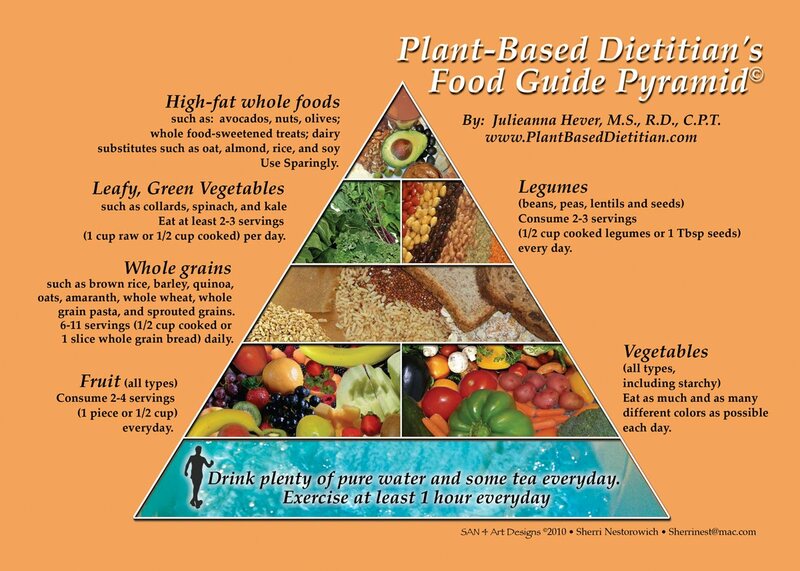 There are almost as many food guide pyramids out there as there are diet books. I have yet to find one that meets my standards for an optimal plan. Thus, I decided to work with my graphic designer, Sherri Nestorowich, to create a visual guide for the whole food, plant-based diet I recommend to my clients and students. In the vegetable category, it includes carotenoid-rich and starchy vegetables. Carotenoids are high in antioxidants (protect cells from damaging effects of free radicals); provide a source of vitamin A; enhance immune function; and help reproductive system function. Specifically, it includes: carrots, greens, sweet potatoes, tomatoes, bell peppers. The starches are rich sources of complex carbs, fiber and include potatoes, squash, and corn. Fruit contributes vitamins A, C, some B vitamins as well as some minerals. Dried fruit may contain iron. This section contains all whole fresh fruit and frozen fruit (which should be the priority and majority of fruit consumption) even though it can also include dried fruit, whole fruit juices, canned fruit (in order of health-promoting capacity). Further, I have a separate category for leafy green vegetables additional to the foundational vegetable recommendations. My new quote that I tell my clients and students is "Let thy greens be thy medicine and thy medicine be thy greens". Leafy greens are chock-full of macro- and micronutrients, including calcium, fiber, folate, vitamins C, B6, B2, E, potassium, manganese, magnesium, phytochemicals (such as lutein, beta-cryptoxanthin, zeaxanthin, beta-carotene). This category of vegetables include kale, collard greens, spinach, mustard greens, beet greens, turnip greens, romaine lettuce, bok choy, Swiss chard, rainbow chard, Brussels sprouts, sea vegetables, broccoli, Napa cabbage. See my previous blog, The Greatness of Greens, for more about the undeniable superhero-esque power! I can go on and on about the beauty of greens...but there are so many other topics to delineate with respect to why I chose the food groups I did. Whole grains are the backbone of the plant-based diet as they contribute calories, fiber, protein, iron, B vitamins, trace nutrients in whole grains. This category includes: corn, brown rice and sprouted tortillas; whole grain breads; cereals (i.e. oats); bulgur; brown rice; couscous; millet; quinoa; whole grain pasta; polenta; wheat berries; popcorn; wheat germ and bran. Legumes provide a supporting role in the diet. They are used extensively in international cuisines and provide protein, fiber, iron, calcium, zinc, selenium. Legumes include cooked & dried beans (adzuki, anasazi, black, black-eyed peas, cannellini, chickpeas, great Northern beans, kidney beans, lima beans, navy beans, pinto beans, soybeans), lentils, peas, split peas, and soy products (tempeh, tofu). At the top of my pyramid, I have listed high fat whole foods, dairy substitutes (which are great sources of fortified vitamins B12, D, and sometimes calcium), and whole food sweetened treats (which can be done by using dates, date syrup, pure maple syrup and other fruits). High fat whole foods refer to olives, avocado, nuts and seeds, which are important in order to consume adequate omega 3 fatty acids, monounsaturated fatty acids, fiber, protein, fat, iron, calcium, and trace minerals. All of these items should be used sparingly and less in situations where weight loss is a goal or when there has been a diagnosis of heart disease, diabetes, high cholesterol or other metabolic conditions. Overall, I hope that this pyramid is used as a guideline. The serving sizes are not necessary to perfect...it is more important to look at it as a way of proportioning out what a day's worth of food should look like. The foods closer to the bottom should be a mainstay or foundation of intake and those near the top are to be used as support. I also highly recommend everyone consume a vitamin B12 supplement of either 10μg daily OR 2,000μg weekly and have their serum vitamin D levels checked. If your serum 25 hydroxy D levels are less than 35 ng/mL, it is necessary to increase sun exposure (during peak hours and with no sunscreen for a few minutes a day...without allowing any reddening of the skin to occur) and possibly add supplemental D2. Please speak with your physician to address this issue. I believe the author is on the staff of the Nutritional Education Institute, founded by Dr. Joel Fuhrman. As such, I'm somewhat surprised that leafy greens are not given more prominence on her pyramid. Based on what I know of Dr. Fuhrman's dietary recommedations, I would think that the pyramid would feature leafy greens, vegetables and fruits above the water image. Next legumes, next healthy fats, and grains, the least nutrient dense of all the foods shown, on the top. Even better, as greens are the most nutrient dense of all foods, leafy greens should be where the fruits and vegetables are. Next level for fruits and vegetables, next legumes and healthy fats, and grains still on top. Hi. Any chance this pyramid is available in pdf and can be printed? Is there a print frienly pdf like the Dr. McDougall site uses that will be available for this article and pyramid ? 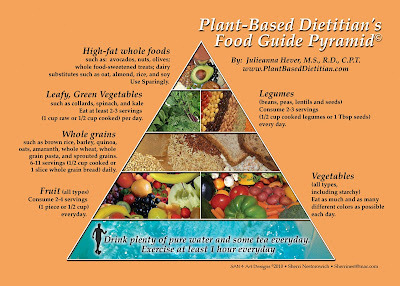 If you go to my website, www.PlantBasedDietitian.com, there is a tab with the pyramid and you can click on it and then print it from there. If you have a problem, please e-mail me directly from my contact page and I will send it to you. Great Food Pyramid! Thank you very much!